I don't know many people who use Bandcamp as feverishly as I do. I will spend hours looking for new music on the site, subjecting myself to what must amount to light torture in my exploration of good music. Thankfully, I usually come through in the end with a winner. 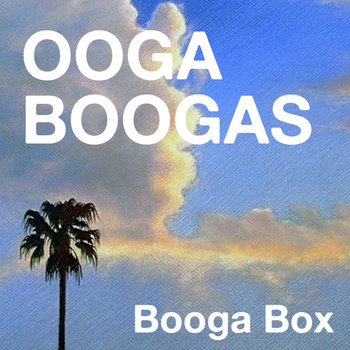 I know nothing about OOGA BOOGAS. I randomly came upon them in the same feverish search I just mentioned, and breathed a sign of relief upon hearing their music. A collection of all their songs from their vinyl releases, Booga Box plays much like you think it would, giving the audience a glimpse into the bands transformation over the years, however long or short that may be. And what a interesting and varied transformation it is. Booga Box starts off so strong it may have honestly affected how I perceived the rest of the album. The opening track, "The Octopus Is Back", is a quick garage rock ditty that honestly had me nodding my head to the beat of the song (Something outside of a concert I rarely do). It excited me in a way few opening tracks have recently, and that's impressive in and of itself. "Diggin A Hole" and "I Can't Clear My Name" are further testaments to this bands garage rock roots, fitting somewhere between The Hives and The Cramps. But from there, things begin to change. Knowing this to be a collection of the bands vinyl works, I knew things were going to be varied, but it almost felt like I was listening to a compilation more then the same band throughout. Songs like "On Safari" and "Oogie Boogie" come across as more surf rock than garage rock, which is fine because those two genres are often cited with one another anyways. But then you'll do a double take when a song like "Eisbaer", which reminded sounded like some punk song from the 80's, comes on. It's not that it's a bad song, on the contrary, I actually liked it, it just feels like it doesn't blend well with the rest of the tunes before it. Towards the end of the album, things seem to start unraveling. "Mind Reader", the weakest track of the whole album, totally threw me for a loop. I felt like I had suddenly walked into a bar meant for people 40 and up, with a band playing a song a little bit Jimmy Buffet, and a little bit jam band. It just doesn't fit in with the rest of the albums songs, and makes you wonder what happened to the fun music these guys were making when they first started the band. Even a song like "It Is A Sign", which I did like overall, feels unfulfilling because it doesn't capture the bands earlier energy, and instead replaces it with a radio friendly indie-rock vibe.